Altmetrics are “alternative metrics” to measure the influence and reach of scholarly output on the Web through peer-review counts, influential news sites and blog posts, citation manager bookmarks such as Mendeley, Wikipedia citations, and social media mentions on sites such as Twitter and Facebook. Altmetrics go beyond the traditional citation metrics to take into consideration how scholarly output such as journal articles and research datasets are being cited and shared by others on the Web in order to measure influence. They are meant to complement tradition metrics, not replace them. Altmetrics counts (and scores) are updated much more quickly than traditional citation counts so are especially helpful with “hot topics” getting mainstream attention where citation counts can lag by months and even years. Altmetrics are basically counts of mentions and links to scholarly journals and datasets from reputable news sites (and aggregators) and blogs, peer-reviewed sites, reference managers, and major social media sites. 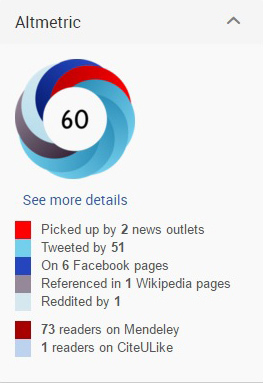 The company Altmetric uses a weighted score with a Twitter post counting as 1 point, a news article counts 8, a blog is 5, and a Wikipedia link is 3. Sources counting less than 1 point include Facebook and YouTube at 0.25 point and LinkedIn at 0.5. Wiley added altmetrics to Wiley journal articles in the Wiley Online Library in 2014. Elsevier added Altmetric scores Scopus in 2012 and to ScienceDirect in a pilot project in late 2013, but in 2015 switched to their own altmetrics system for ScienceDirect and Scopus. We are seeing altmetrics incorporated into several library products. Two of the most prominent companies, Altmetric and EBSCO’s Plum Analytics, provide altmetrics to vendors for inclusion in services such as discovery tools and institutional repositories. 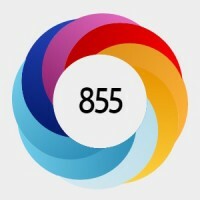 In October 2015, ProQuest announced the addition of Altmetric badges to 360 Link and ProQuest databases. On the abstract page of some scholarly journal articles in ProQuest databases will be displayed an Altmetric badge with basic details of the article’s reach on the Web. Users can click through to see the complete details page [Altmetric.com version]. In February of this year ProQuest added altmetrics to its Summon service for free. Libraries using Summon simply need to turn on the feature. If available, search results will show an Altmetric score. Hovering over this button (see below) shows more detailed counts. Like above, users can click through to see the complete details page. This same information can be displayed in the right-side preview panel. Unlike Altmetric, PlumX does not give a score. At the bottom of the abstract and information page, PlumX displays a count of these metrics by category with a link to see details. Impactstory is another service providing altmetrics. Its focus is on individuals who want to learn the impact of their research output. It’s an open-access website which you can access with an ORCID. Altmetrics: a Manifesto – Definitive post from altmetrics.org. Against the Grain – Link to the article “Altmetrics: Documenting the Story of Research” (2016). arXiv – Link to the article “Altmetrics in the wild: Using social media to explore scholarly impact” (2012). Impactstory blog – Link to blog post “4 things every librarian should do with altmetrics” (2014). NISO Altmetrics Initiative – Project to create standards and best practices for altmetrics. This title is actually an issue of Library Technology Reports from ALA Tech Source. 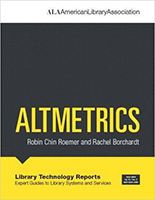 The report “outlines both the promises and major obstacles faced by the field of altmetrics” as well as covers the librarian’s role in providing education and support of altmetrics. Published in 2015. This forthcoming book gives an overview and the theory behind altmetrics. It looks at the ways libraries can utilize altmetrics and educate researchers. To be published in June 2016. This scholarly book looks at key altmetrics research innovations. It presents the data sources used. Finally, it looks to the future to determine alternative metric trends. Published in 2015.